The 2015 Sales Convention for Tahiti Tourisme took place in Papeete in September. It was busy days with all teams presenting their achievements and plans for "The Islands of Tahiti" for the coming year. Thank you very much to the team in our Head office for organizing and taking so good care of us. Travel agents interested in learning more about the destination New Caledonia are invited to join our webinars in November 2015. The educational webinars will take place on the 10th, 11th and 12th November. From the 6th to the 8th November Veranda & Heritage Resorts will participate at the Dertouristik Brochure Presentation in Hamburg. We look forward to being part of this great event, meeting partners and travel agencies of all Dertouristik brands. Our E2M team will be participating at this years WTM in London from the 1st to the 4th November 2015. If you wish to meet our team, please send us a message. Veranda & Heritage Resorts will be joining the Mauritius Roadshow in 4 cities in Germany from the 19th to the 23rd of October. Kick off is in Stuttgart then we continue wie Nürnberg and Dresden to end on Thursday evening in Bremen. We look forward to meeting many travel agency expis. We are very proud that our 5* All Inclusive Resort Heritage Awali Golf & Spa has been recognized as one of the best rated hotels on Holidaycheck.Congratulations to the team of Awali who has been (and still do) work very hard to keep our guests happy. The luxury tour operator Fert used their beuatifull locations directly at Lake Geneva for a One-Week promotion of "The Islands of Tahiti". 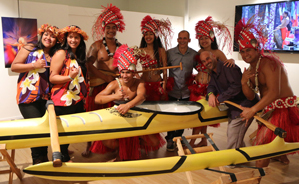 Included in the promotion was an exhibition of photos from French Polynesia and an outrigger canoe (loaned by Vaa Club, Evian). On the evening of October 6th, Fert and Tahiti Tourisme had invited clients to a VIP evening with Tahitian dancers, a Tahitian Chef cooked specialities from French Polynesia. What a great event to give the guests an idea of what “The Islands of Tahiti” has to offer.